Just curious how many the forum may have, and yes I am one. Yes,,,,,,,,,,,starting in 1994 for me. In 1994, Pennsylvania set the standard for the United States by creating a set of best practices in the landmark Pa. Act 102. These best practices for organ and tissue donation were adopted nationally. I donated a piano to my mother’s church once. I’ve just about used up these organs of mine. Unfortunately I’m not cleared to thanks to an inconclusive syphilis infection test – the system being what it is, I can’t overrule that with a third party lab test either. Can’t donate blood either. It’s been a few years since that and it’s still frustrating as all hell. In the words of John Dunsworth, “When your dead your dead but, you aren’t quite so dead if you contributed something”. So that is a YES from me. As someone that received a new kidney nearly 10 years ago, it is really nice to see people that are already set up to donate their organs. It’s a huge huge thing that the recipients can never thank you enough for. I am as well. Just hope the things I did in my youth do not impair their use in the future. Now my addiction is flashlights and motorcycles. Wish I would have stumbled on the latter sooner. Problem is 25 to 30 years ago Maglights were all the rage. They didn’t do much for me then either. Donated a kidney to my brother over 25 years ago, transfer wasn’t 100% successful, but shortly after he received another one from someone who had signed up on the donor list. Later this year my brother and I will be celebrating my brother’s daughter’s wedding. In 2016, more than 60 percent of all the people who received organ transplants were 50 or older. Nearly 19 percent of all organ transplant recipients were 65 or older. In 2016, 1 out of every 3 people who donated organs was over the age of 50. You’re never too old to make a difference. Me too. On my DL. However I have MS so I may need to look at whether that disqualifies me or not. I started driving a Motorbike with 16. Because we are prone to head injuries i thought it would be a good idea to carry a donor card with me since then. But since i am diagnosed with Crohn’s disease (the reason why i am in hospital again at the moment) i do not know if they can use much of my organs. I hope they can use at least a few to help someone if i go out. But taking “a lot of meds” (immune suppressing meds and pain meds) could be a problem. It says I am on my DL. 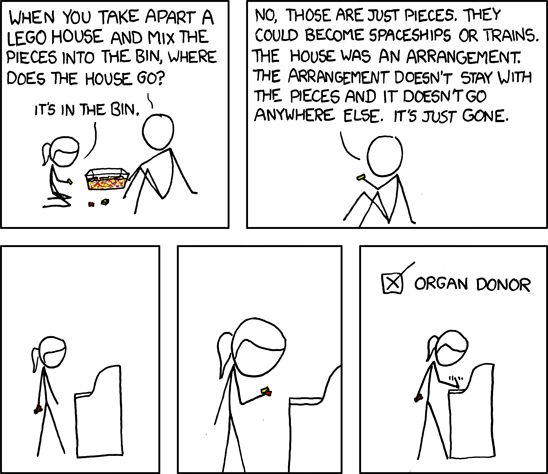 I am an organ donor! My driving licence has said so since it was instigated on them. I think it should be compulsory for ALL. You only dead meat and bones once the brain dies. I also think it should be legal to turn yourself off when you want to. It’s YOUR meat and bones. Not some stupid politicians. As long as you see psychiatrists when brain still working legibly. Who are they. (Anybody) to try and tell you when YOU can die. I won’t be a veggie. Holland and Euthanasia are already arranged here. I think so but I’ve had a pleasant life so I doubt if there’s anything useful when I check out. Signed up when I started riding motorcycles 30+ years ago. Yes, and it is one of a few things i share with my fellow countrymen, otherwise i try to distance myself as much as i can from other people in this country.